I wouldn't describe myself as an eavesdropper, per se, but given the opportunity to overhear, I'm likely to listen. I love to hear other people's stories, which is why I love to listen to This American Life, The Moth, StoryCorps and This I Believe. Everybody has a story - you just need to listen. The other day I was trying on some clothes in the dressing room at the hospice thrift store when I had the opportunity to overhear an interview between the store manager and a volunteer candidate. Stuck in a dressing room, I really had no choice but to listen. The manager explained that the goal of the staff was to create an inviting environment in the store, where people were free to come in just to hang out and chat. "You might be the only person they have a conversation with that day," she said. I believe this to be very true. Just before going into the dressing room, I had a nice chat with an older man in the woman's blouse aisle. He had made eye contact and smiled, and I said, "Hello! How are you today?" "I'm wonderful, and getting better every day," he said with a smile on his face. "Wow! That's really promising," I said, feeling that some days I feel quite the opposite. He went on to explain that after 8 rounds of chemotherapy, his cancer was completely gone, and life was good. He had a story to share, and he wanted to share it. I happened to be in the right place at the right time to hear it. So I made an effort the rest of the day to be receptive to opportunities to talk to strangers, chances to hear more stories. I chatted about how fun it is to dress babies with a grandma at the cash register who was purchasing clothes for her granddaughters. I talked about purses and shirts at the check out stand at Whole Foods. I discussed reading and favorite book series with the woman behind me in line at Barnes and Noble. Her stack of seven or eight thick paperbacks intrigued me, and all I had to do was ask her about them. Yes, despite what I was told in safety classes as a child, I talk to strangers. I have a strong feeling that I come from a long line of people who talk to strangers. My dad talks to everyone, and I'm inclined to think that his dad did too. I don't warn my children not to talk to strangers, after all, aren't strangers just friends you haven't yet made? Keeping children safe is more about teaching and modeling, and less about instilling fear. If kids never talk to strangers, they will miss out on some incredible learning experiences. My daughter and I were walking down our street the other day when she said, "I bet if I tried harder I could make a lot more friends right here in our neighborhood." I bet she wouldn't have to try very hard. Just listen and say "hello, how are you?" at the right time, to the right person. That's how I've heard some great stories and made most of my friends. And by the way, I don't actually have a shirt that reads "I Talk To Strangers" - though wouldn't it be cool if I did? For years now I've wanted to make screen printed tees (they're all the rage, in case you haven't overheard), but I haven't gotten around to figuring out the whole screen printing process. Then after seeing a flickr friend's post process tattoo (that's right - she picniked it right onto her skin! ), it hit me - I could "make" my tees online. So don't be surprised if you see a lot more t-shirt covered bust shots around here. It's just my hypothetical t-shirt company. It's much faster and easier than learning to screen print. Now, this is a great post! I, too, talk to strangers. And I am always encouraging my children to dare to ask the question. People want to tell their stories and we need to listen. I look forward to seeing your T-shirts - however they appear. doesn't seem that everyone is just so busy that they no longer take time to just say hello. When we slow down our lives we have time for more conversation. I love a good story too. I'm a talker too - it always makes my kids laugh. But really, who wants to stand in line looking gloomy? I'm ordering a screen printing kit that Blair recommended - I'll let you know how it goes. ok, molly. NOW I officially love you. from the t-shirts to the talking, you are a good, good person. I just read the book Olive Kitteridge, and what I most took from it is that everyone has a story, and a perspective, that only needs to be heard and understood-if not agreed with, at least heard and understood. And I think that especially the elders among us need to only have a friendly smile, and some eye contact, for god's sake!, and a "how are you" to give them the chance to tell their stories. I always talk to strangers and a lot of the time, they will walk up to me and talk. In fact it happened yesterday a lovely man with large breasts decided to compliment my tattoo and in the end we were talking about kids and life and what it leads too. My grandmother used to say it was because I have an old soul, which is a very romantic and beautiful notion. Everyone has a story... if you just listen you might learn something very important. Sometimes I don't listen like I should, but this post is a good reminder! one of the reasons i like my mundane out of the house job as a small credit union teller, is that i get a chance everyday to talk to people. we are super small serving the local V.A. hospital and i love to talk to the same people every week, we know who is getting married, who's son just died, who just had grandchildren, who's retiring. I have been thinking about the concept of talking to strangers lately and in fact was planning to blog this week about it. You have given me more to think about. Thanks. Oh, me too! I talk to strangers, and I *listen* to strangers. It makes me feel like so much more of a participant in this wild and intriguing world we live in! Life is Relational. And I would so buy your shirt, if you ever figure it out! Shy as I am, and unlikely to strike up conversation with strangers myself, "don't talk to strangers" is still a pet peeve of mine. It instills fear and distrust, as well as being pretty much impossible to do (how else do you make friends? get directions? etc, etc, etc.) Love what you have to say about it. I talk to strangers too. Everyone has a story, if we just take the time to listen. I love you EVEN more after this incredible post! I'm a talker, too. I love your new t-shirt "co." can't wait for more! During my first round of chemo, I struck up a conversation with an 80+ year-old man who had been doing chemo for, like 10+ years. Our conversation -- about everything under the sun -- took my mind off of what I was experiencing. And, at the end of our rounds, he said, "This is the first time in years that this has been a pleasant experience for me." I work in a bookshop and it is very important for me never to be too busy with the 'doings' of the day to be unable to chat with the people who stop in. Sometimes those conversations are better than pay. A lovely post! And yes, me too I'm a talker. When in line at the supermarket, at the bakery, on the metro, ... I like to hear people's stories. I live in the South and truly feel like we have a higher percentage of people like you than in the rest of the country. We all talk to each other in checkout lines or grocery store aisles. I've always assumed it was a Southern thing because when I travel I get weird looks when I try to start conversation. Or maybe it's a Surburban thing? I live in a decent sized town but no metropolis. Either way - if you ever find yourself in Huntsville, AL? You'll be pleased with the number of people willing to talk to you. I love it. Wonderful thought! You inspire me to get out and talk more. Thank you! Great going on the T-Shirt too. I love, love this post. Perfect. I'm going to go talk to strangers today. thank you for this post. talking to strangers is exactly what i need to do instead of complaining about my lack of friends here in this new place. often times all you have to do is offer an ear. I also talk to strangers and don't dissuade my children from the practice. I hate stranger danger propaganda and tell my kiddos to listen to their gut when confronted with a new situation. My dad will talk to anyone. He waves at anyone who drives down their street. He works in a hardware store and is perfect at the job. It used to bother me, but then I realized people have so much to share, if I just talkt he time to listen. BTW - thanks for the toms/hens idea. I did it with my hs science club and it was a hit!! That was a lovely post, thank you! I agree, some of the most delightful connections can be the short chats while I'm tossing a ball at the dog park, buying fabric, or browsing at the book store. this very same topic has been on my mind as of late. i thought as i sat in church alone last sunday just how terribly alone i felt. it was almost an embarrasing feeling. i can imagine that life like that on a daily basis must be the most terrible existence. thank you for being thoughtful enough to share that with your many readers. i am going to pay it forward and post about it on my blog. I find myself swinging between loving talking to all the strangers in the city (it's how I found out about a woman's quilt embroidered with her family tree and the duplicate she's been working on - for decades - for her daughter) and avoiding talking to all those strange people in the city. Thank you for sharing your thoughts on the subject. p.s. I love the butterfly wing banner! On safety and talking to strangers you would like Protecting the Gift by Gavin DeBecker. Contrary to a lot of popular advice he says we should absolutely teach our children to talk to strangers. We do it every day and telling them not to sends conflicting messages, plus by teaching them to interact with strangers we give them the ability to know who they should go to for help should they need it from a stranger someday. He thinks it is far better for kids to approach someone for help (he suggest teaching them to find another mom with kids) than for a kid who is afraid to talk to strangers to be approached by someone offering help (because that person is more likely to be a predator). Such a lovely post. I stopped the car the other day to say "hello" to a gentleman farmer down the road from us who was out getting his mail. Told him I loved his farm, drive by all the time, blah, blah blah. He looked at me like a had lobsters coming out of my ears! I didn't care! I'll say hi if I see him again. Smiled-waived! I'll second zoot. After living in the south, people seemed more receptive there to wave and say hello to strangers. I am bringing it to the north...one wave at a time!! If you are looking for me, I'll be the crazy lady waving in the Volkswagen..
i would guess, if we ever ran into each other, a conversation would occur! i try with most people i meet:) this was a great post--love your tshirt! I love to talk to strangers too! I love to hear the stories everyone has to share. Thanks for this post...it was so encouraging. I'll think of you next time I strike up a conversation with a stranger and I'll secretly smile. what a wonderful post, molly! SO loved it!! what a great reminder to SLOW down and notice another. take the TIME to listen to another. be BLESSED by another. thanks for doing all three for me today. This is great! I just had the "don't talk to strangers" conversation with my husband. We both said how sad it was we grow up with that idea! I never want my kids to feel that way! Thanks for sharing your talks with strangers! You could make a cafe press t-shirt shop for free, and people might buy them. No joke! I talk to strangers, too. My husband does not. He pretty much can't believe that I do. You should have seen me in Disneyworld. But come on, you're in a line for an hour surrounded by people from around the world! Why not chat it up? beautiful post! older people are my favorite strangers to talk to because I never fail to walk away feeling I learned something. I like your hypothetical t-shirt company! Maybe I could go on a hypothetical diet!! LOL! I totally agree with you that "don't talk to strangers" is horrible advice to give to children. So many good bits in this post. And if you ever made that shirt I'd buy one in every color for my mother-in-law. It would be so fitting and she'd get such a tickle out of it. okay, i've commented on this post so many times in my mind. today i am determined to actually type out my response! not being able to talk to strangers is one of the hardest parts of living abroad. i didn't realize how much those small moments of seemingly meaningless chit chat mattered, until i couldn't make them anymore - due to the language barrier. there is no talking weather with the grocery clerk, talking to the mailman, visiting with the family walking up the street. those small little interactions are so important. they connect us to others and remind us that we're not alone in a sea of strangers. actually, i've come to cherish this type of chit chat since i've been a SAHM. Even though i am an introvert, i really miss the company of adults. i found little bits of company in the adults i saw around the neighborhood. it *is* meaningful. my sister lives in Hawaii and 'talking to strangers' is part of the culture. as a Hawaiian you are expected to "talk story" with the shop keepers while you're there. if you don't it's thought that you don't have any aloha. my girls are painfully shy and don't look at or acknowledge any stranger who coos at them. we've had many long talks about when it's okay to talk with 'strangers' and that it's always okay when they are with mom or dad. my talks have had no effect yet, but i'm hoping the message sinks in eventually. I',m like my Dad, too - he always talks to strangers and so do I. Thanks for giving me food for thought about my biggest question of late.... about how I should teach my child (who also talks to strangers) about dangerous people when she sees me talking to everyone. You continue to inspire, Molly. Thank you. I love the story. I'm the sort of person that attracts people. People strike up conversations with me, ask me for directions, or ask me to take their picture all the time. I inherited this gift from my mom. love this- what a fantastic post and way to go about your day- talking to strangers is sometimes a very good thing :)! Beautiful post Molly, as if I didn't love you enough already ; ) What you have written is so very, very true... I come from a long line of people who talk with strangers and have benefited greatly from it. Isn't that just how all of us bloggers have met too? Putting our voices out there through our blogs and through our comments to others. I have met so many beautiful people in this community and in my everyday community because of it! Um, your shirt is so fabulous and I love that you did this!! Bring on the shirts mama! 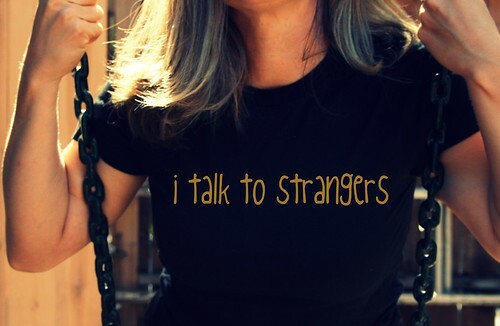 Woo Hoo - I love your 'I talk to Strangers' shirt! I've just been thinking recently how disconnected people seem to be. Everyone walking around in their own little zombie cocoons, and not making those vital human connections. So your day of speaking with strangers is a sweet vignette of a day of being intentional. We could start an army of connectors, a corp of people bridging the gap - and we could all be sporting those tees!! That's one thing that's nice about living in a small town. I talk to strangers ALL the time though I didn't before we moved here. I love that my sons and I can go to the park and make new friends. I come from a long line of people who talk to strangers as well. Hi, I just found your blog via The Crafty Crow. Nice to meet you. I don;t blog much but I'm a big reader! I talk to strangers. I was interested in the comment that talked about Hawaii, and "talking story". I grew up in Hawaii, and never realized that it might be one reason I'm so friendly and ready to talk to everyone. I just have to be careful and rein myself in when I'm accidentally over hearing something; it's hard to resist when the conversation captures me. How did you get that on your t-shirt? That was cool! hello and welcome twobadmice! i too have to be careful about jumping into conversations i overhear :) about the shirt, i used picnik.com to add the words to my shirt. i love picnik - it's free, easy and full of possibilities!